The previous two chapters discussed the overall state of the remnant eastern Siouan people in the late 1700s to early 1800s, and the racial climate they had to endure daily. In turning our attention to the history of the Catawba Indian community of northwest Florida, we must address their ancestral families. The majority of the family groups who migrated into Florida in the 1820s, had previously maintained residence on the dwindling Catawba reservation lands in northwestern South Carolina. By the time of the Florida migration, the majority of the reservation lands had been leased to white farmers, and the Catawba were surviving economically by the collection of lease payments and pottery sales. The lack of land to live on, and the inability of the government of South Carolina to collect the white settlers lease payments, caused many Catawba families to migrate outside the Carolinas. The fact that Catawba families had migrated into northwest Florida is beyond doubt. In September, 1853, a band of 18 Indians, all of whom claimed to be Catawbas, was reported by Brigadier General G.B. Hall as wandering near Stockton, Alabama (near present-day Atmore, Alabama). Their leader was named Taylor, and the band represented two families: Taylor and Houser. There were four men in the group; the rest were women and children. They said they came from northwest Florida, and were enroute to Arkansas, but were stranded for lack of money and had been begging corn and potatoes in Alabama where residents were anxious to get rid of them. The fate of the Houser family remains unknown, but the Taylor family established a household on the Creek reserve in Atmore. When the Catawba families arrived, they were not the only Indians in the area, however, plans were already underway to clean the landscape of the troublesome Creek and Seminoles residing there. By the end of 1839 the final emigration of the Creek Indians living within the treaty reserves along the Apalachicola was complete. However, treaty, tax, and census documents record the presence of another group of Indians living in the area of the Apalachicola River. These foreign Indians were obviously considered different and separate from the Creeks. After leasing out all their land on the reservation, and possibly hoping to continue a tradition of military honor, a handful of Catawba families ventured into northwest Florida. 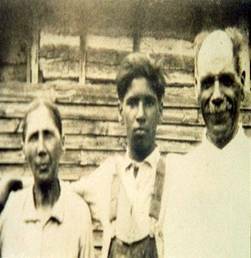 After serving as friendly Indian scouts against the hostile Creeks and Seminoles, these mixed-blood Indian families settled down into quiet lives as farmers, stock keepers, and ferry operators, just as they had previously done in South Carolina. The presence of Catawba Indian families in the Apalachicola River valley can be documented as far back as 1828, when Absalom Scott, Jacob Scott and his wife Polly Harmon, Richard Jeffers, John Jones, and Joseph Scott appear on Jackson County tax records. It does not appear that any Catawba were present prior to that time, as they are not mentioned in the Treaty of Moultrie Creek of 1823. 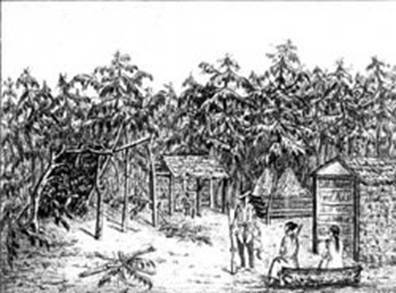 It appears that even service as scouts in the militia would not guarantee complete safety; however, and in 1837 the families of Betsy Ayers and Sally Ayers were mistaken for hostile Indians and held at Dog Island by Lt. Berrian in preparation for removal to Indian Territory. The family members of Betsy and Sally were eventually adopted into citizenship in the Choctaw Nation along with several other Catawba families. one mile square, at the Ocheesee Bluffs, embracing Stephen Richards fields of said bluff, be conveyed, in simple, to said Stephen Richards. Richards, of North Carolina, was homesteading in Calhoun County prior to 1820, and was serving as an interpreter for U.S. Indian Agent Gad Humphreys. Richards continued his work as interpreter in the May 1832 treaty of Paynes Landing. On October 15, 1837, Captain Stephen Richards was empowered by the West Florida Militia to form and outfit a mounted company of Indians for service against hostile Creeks and Seminoles. Most of the recruits for this Company were Creek Indians from the newly created Apalachicola reservations, yet there are many persons appearing on the Company roll that bore English names and were from such areas as North Carolina and Virginia. The names of William Brown, R.B. Evans, James E. Farley, and John Newcommer are particularly interesting. Later censuses would later identify these individuals as being born in either South Carolina or Virginia, and James Farley was identified as Indian after he later moved to Georgia. A Captain Newcomer signed a 1753 letter along with the famous Catawba King Hagler, and Indian Trader John Evans was mentioned as having a half-breed son among the Catawba Nation in 1733. Even though the Catawba were willing to shed the blood of their own race to protect their white benefactors, this proved to not guarantee their own personal protection, even from the very people they had tried to protect. Joseph Scott had been living in the area of Calhoun County since at least 1834, when he first appears on tax books as a free male of color. The household of Joe Scott was the only home headed by a free person of color documented on the 1840 census of Calhoun County where he was listed as between 51 and 60 years of age. It appears that Joe was a respected and well-known leader of his people then, but still even that position and title was not enough to save his life. In 1846, Old Chief Joe, a well known Indian Chief.. was stabbed in the head by a white man in an altercation over a roll of calico cloth. Chief Joes son (probably the younger Joe Scott who appears on the 1850 census) was present and witnessed his father fall. 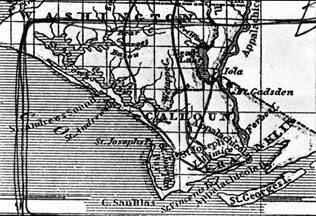 According to the 1846 newspaper account, Old Chief Joe called out to his son Thwatka which is most certainly a variant or mis-reproduction of the Siouan phrase Thwalka, which translates to he has killed me. The area that Old Chief Joe was killed appears on an 1842 map of north-west Florida as Dead Lakes, but later became known by the name it was called by the local Catawba Indians, Wewahitchka from the Siouan Wewa or Ee-wa meaning to submerge in water, and Itchka or Hitchka meaning dead. The name of this area of lakes and swamps is undoubtedly a reference to the numerous dead cypress trees that naturally fill the lakes and streams of this area. The violent death of the beloved Chief Joe obviously sent ripples of fear through the local Catawba families and they seem to have temporarily abandoned their habits of wandering the area hunting and fishing. On the 1850 Federal census the Catawba are recorded as living in a tightly grouped settlement on the Ocheesee district (north-west area of Calhoun County) property of their white benefactor, Captain Richards. This fear was not long standing, however, and the Catawba gradually returned to their custom of having hunting and fishing camps. The families of Thomas Ayers, Susan Smith, James Martin and Malachi Scott are recorded as doing just that on the 1880 census of southern Calhoun County. An interesting event occurred just seven years after the recording of this census. In 1857 James Butts (head of household number 67) was called before the Jackson County Court to answer to charges of Adultery & fornication with a free mulatto. Butts challenged the charge based on the fact that the female he had been co-habitating with did not fit the legal definition of a mulatto. Several white witnesses were called including Captain Stephen Richards and John Chason, and the Judge dismissed the charge. The awarding of military service land grants in the mid-1850s resulted in a split of the original Ocheesee Bluffs Catawba settlement. Jacob Scott chose 160 acres at the site where old Joe Scott had lived in southern Calhoun County on the Chipola River. Here Jacob constructed a ferry service and mill. This settlement became known as Scotts Ferry, as it is still known today. 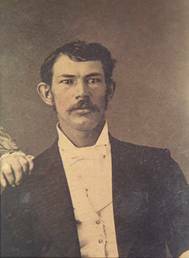 Absalom Scott lived briefly at Scotts Ferry until a close friend, John Chason, acting as Absaloms land agent, was able to secure him an 80 acre tract in south-western Jackson County at the headwaters of the Chipola. The Ayers family would chose land in mid-western Calhoun County near the banks of the Chipola at a site near present-day Clarksville. Having less Indian blood than the other Catawba, The Ayers did not maintain an identifiable separate community and continued to out-marry with local white families. Although they did not continue to be identified as part of the Catawba community, the more socially adept members of the Ayers family did speak out for them on several occasions, and many of the Ayers descendants still speak with pride about their Indian ancestors. Copyright ©2006 by Steven Pony Hill, all rights reserved. Comments, information, records, whatever, please contact ye webmeister. Copyright ©2006 Steven Pony Hill, all rights reserved, and may not be sold, nor given to anyone who may attempt to derive profit from same, without written permission of the author. It may be used in your family history or genealogy, for which purpose it was intended.